These are so easy and they just come out the way they want to. So I’m just going to give the basics. fiberfill or stuffing of some sort (I really like the expensive silky stuff but have even washed and reused old pillow stuffing). Start with a sock. You can buy a new pair if you like (I did buy a really cute pair with a fox on it to make one for someone special who likes foxes). Most of the time I just use old worn out or stretched out or discarded ones. It’s a great thing to do with those single socks that seem to turn up without their partners. You can also use tube socks, but they turn into different looking critters. But they still work just fine. 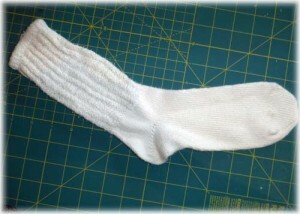 Take a quick look at the sock. 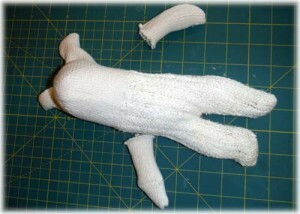 The toe end will be where the ears are and you will cut the arms from the end of the toes. The heel will be the face and the cuff will be the legs and body. Got that? Good! If there aren’t any questions, let’s get started. Lay your sock out so that the heel is on top and flatten it out as best you can. 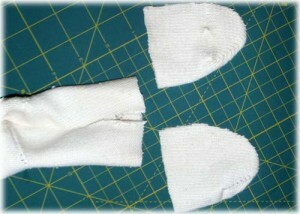 Then cut toe end (remember this is the ears and arms) down nearly to the heel. It’s a judgement call. If you cut too far you can salvage it by stitching it back up but who wants to do that if they can avoid it? If you don’t cut it far enough you can cut it a little more later. And get it as close to right up the middle as you can. Next, decide how long you want the ears and arms to be and cut off an arm from both ear pieces. I usually cut about 2/3 off for arms, but you could do 1/2. It’s not like there’s a set rule. BTW don’t cut the sock in two like it looks like I did here in the photo. I just wanted to show you 2 pictures for brevity! It’s the magic of Photoshop, not real life! Now we start to sew. Everything is done with just a straight stitch on your machine. Some fabrics are a little harder than others to work with, but so far I’ve not had any I couldn’t manage and I’m not very good at sewing (that means I’ve been teaching myself as I go). Some fabric tries to disintegrate on you so be careful with it. 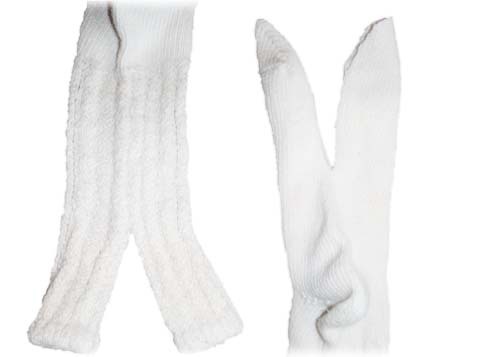 This white sock in the photos was like that but it made a wonderful little creature, really soft and plush. Turn the sock inside out and sew the ears as in the photo leaving an opening in the middle where the ears meet. This is where you will pull it right side after you finish sewing and then put the stuffing in. You can see from the photo that my sewing leaves a lot to be desired so don’t be worried if yours is not perfect either. Sew the legs the same way but don’t leave an opening, of course. Then carefully pull your critter right side through the opining you left between the ears. 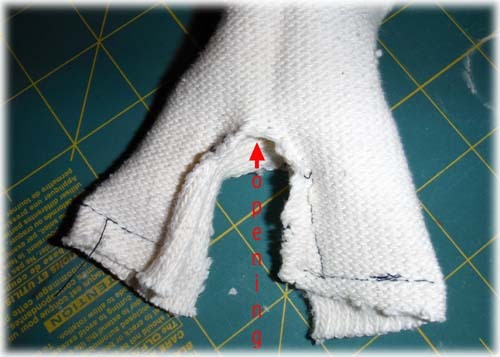 Be careful not to rip out the stitches, altho if you do you can repair them with hand stitching, which you are going to have to do in the end anyway. If you have trouble getting the legs or ears turned completely a chopstick or even a pencil works well. I usually can do these with my fingers, however. 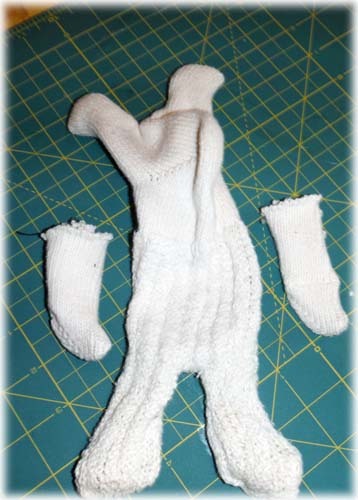 Oh, and don’t forget to sew up the arms. 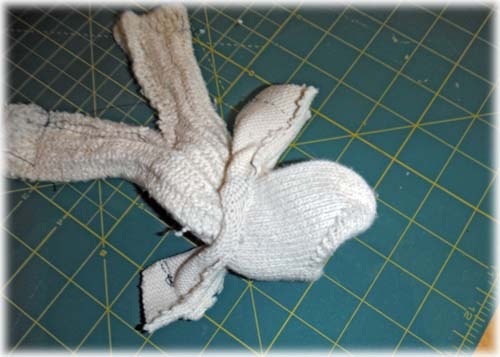 The toe part of the sock should be the hands and leave the other end open so you can stuff them (or not if you like flappy arms!). We’ll get to sewing them on later. Once you have pulled everything through so that you have the inside in and the outside out you should finally have something that looks like a little being! To me this is where the real fun begins! 🙂 He or she starts to have a personality. 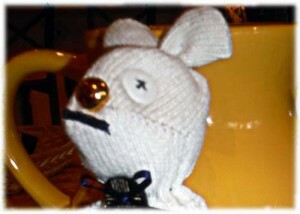 I think you can see that in this photo, even without eyes and mouth or even arms attached, he looks downright audacious! So on to stuffing. Don’t overstuff the arms. They don’t really look all that great if you do, they look like giant sausages poking out. I think they look better if they don’t poke out to the side all the time. For the body take good size pieces and poke them into the hole between the ears. you will need something like a chopstick to help get it down into the legs. I don’t like to put a lot of smaller portions down in there or it looks lumpy. If you can get a gob big enough to fill each leg and stick up into the body it will look smoother. Then a clump that will fill most of the body and then enough to fill the head. Kind of move it around and let it settle and see if you need more. You don’t want to over fill, but you want him to look filled out. Don’t stuff the ears. We have other plans for those. Now we’re ready for the 1/8 inch ribbon. My dog showing friends might recognize this! I think of it as puppy ribbon. Just choose a color that you think looks good with the sock you chose. Or what you already have around the house. I usually do this and the ear ribbon the same color but it’s not required. Using your embroidery needle, stitch the ribbon around his neck, starting right under the chin at the center. Try to stay at about the same level all the way around so you will meet where you started. You don’t have to put a button under the chin but I like to add a little embellishment wherever I have the chance, so I always do. I have a jar of buttons plus I buy more when I see them, take them off of clothes that I’m going to recycle for other uses and also the buttons that come extra with blouses and skirts and such. I like buttons! BUT REMEMBER! If this is going to a child under the age of 3 NO BUTTONS! It’s a choking hazard. Instead you can embroidery on eyes, use felt (I found felt buttons!) and sew it all the way around and other creative ideas I’m sure I haven’t thought of. 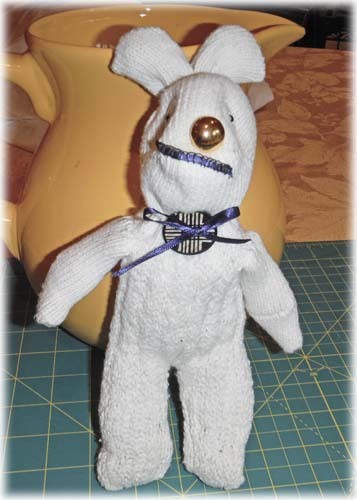 OK, once you have the ribbon all the way around, thread it through the button holes (if it has 4 holes just choose 2), tighten it to give him a neck and then knot it and then tie a bow. 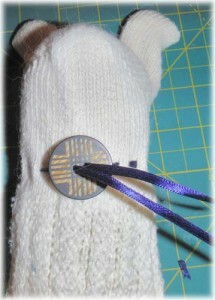 I have sewn a little stitch in some of them but also sometimes use a little Elmers. At this point I can’t say if the glue holds for very long, but I do know that ribbon can untie with much handling and since at least some of mine are going to some children, I thought it a good idea to give it a little extra something. If anyone has a better idea I’m open. Next arms. I just fold down the raw edge (the open end) hold them against the side just under the neck where the ribbon is, on the side of course and stitch them on by hand using a hem stitch with some blanket stitches thrown in. I will admit here that no one taught me to sew and so I don’t know what anything is really called. I used to do a little crewel work and only know what I learned from the kits I bought (and have forgotten most of that). 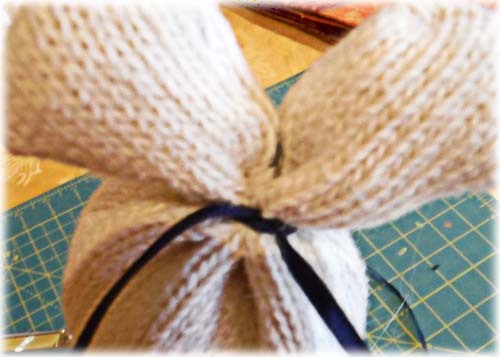 So, if you know more about hand sewing I suggest you use what you know! Just put them on so they don’t come off! Sometimes one arm is a little longer or lower than the other but it doesn’t seem to matter too much. No one has complained yet. Of course, they don’t have voices, so that might be why. Next on to the ears. 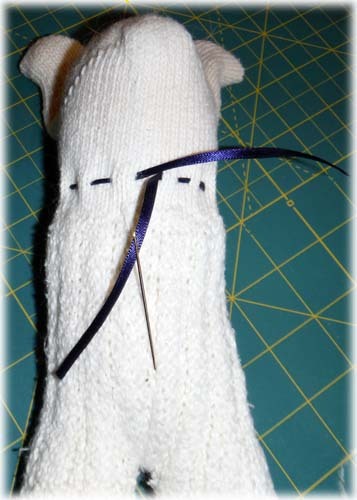 Just turn under the raw edges and use a hem or blanket stitch to close the hole up. I try to use a thread that’s close in color to the sock, but you can see that I don’t always. 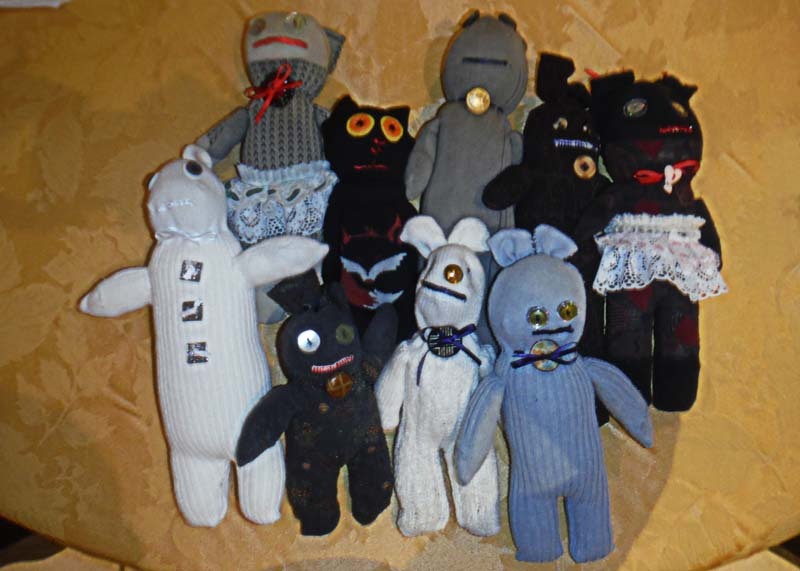 It doesn’t matter that much to me because one of the things I like about my creations is that they look a little bit like a child made them or maybe they made themselves. They definitely didn’t come from a factory. However, if you want it to look more professional use a thread that matches your sock. Then take the ears and holding them together, sort of like a pony tail on top of the head and a little forward if you can manage it, tie a loop of ribbon around them, tightly. I tie a knot in the front and then again in the back. Remember, as tightly as you can. Again, stitch or a little dot of glue, which you will have to give a little drying time. You can kind of arrange the ears as you like. Then snip off the ends fairly close to the knot. I didn’t take photos of me doing the face mostly because it’s difficult to get photos of. But it’s pretty straight forward. Remember, the heel of the sock is the face. Decide where you want the eyes. They can either be forward , in which case they look a little better lower on the face, or to the side, more like a bunny. I won’t lie, sewing the eyes on can be a little tricky, it’s easier if you start out with something simple like a single button with 2 holes. Also, shank buttons are difficult and kind of “hang” instead of being tight against the head. Just something to think about. I prefer sew through buttons, even tho I did use some shank buttons. Also, remember that the thread will be the pupil of the eye, so choose a color that will look good. I didn’t do noses on most of mine, this one just happens to e one I felt needed a nose. Again, a perfect use for a button. But you could also embroidery one (I did that on another one). And mouths. I used a piece of ribbon, cut it a little bigger than I thought I wanted and sewed it on with a blanket stitch (I think that’s the right term). Then I trimmed the ends of the ribbon. You can also dress them up with buttons down the front, dresses (two of mine have dresses because they’re for girls) and well, almost anything. The fun part is socks are all so different that each one has the chance to be a unique creation and by the time you get done with them no two are alike. I hope my tutorial makes sense. This is one of the harder ones I’ve had to put down because each one presents it’s own challenges and the process has evolved from the first one that I did over a year ago. I keep thinking of new things or different ways to make something work a little better or easier, or I forget what I did on one and have to figure out how to do it again. If you make one I’d love to see photos and hear about them. I’m going to make some more and then I need to get the ones that are promised off to their new homes. I’m going to miss them. I guess I’ll have to make some more. My husband had better guard his sock drawer!